Global cloud based payroll software market expected to generate around USD 13,374 million by 2026, at a CAGR of around 6.8% between 2019 and 2026. The introduction of cloud solutions in the payroll and HR domain is making revolutionary changes in services, for both the employees and employers. The report covers a forecast and an analysis of the cloud based payroll software market on a global and regional level. The study provides historical data from 2016 to 2018 along with a forecast from 2019 to 2026 based on revenue (USD Million). The study includes drivers and restraints of the cloud based payroll software market along with their impact on the demand over the forecast period. Additionally, the report includes the study of opportunities available in the cloud based payroll software market on a global level. In order to give the users of this report a comprehensive view of the cloud based payroll software market, we have included a competitive landscape and an analysis of Porter’s Five Forces model for the market. The study encompasses a market attractiveness analysis, wherein all the segments are benchmarked based on their market size, growth rate, and general attractiveness. The study provides a decisive view of the cloud based payroll software market based on product, organization size, application, and region. By product, the market includes free and open-source software and subscription-based software. By organization size, the market includes small- and medium-sized enterprises and large enterprises. By application, the market includes government, banking, financial services, and insurance, IT, education, defense, and others. The regional segment includes the current and forecast demand for North America, Europe, Asia Pacific, Latin America, and the Middle East and Africa. 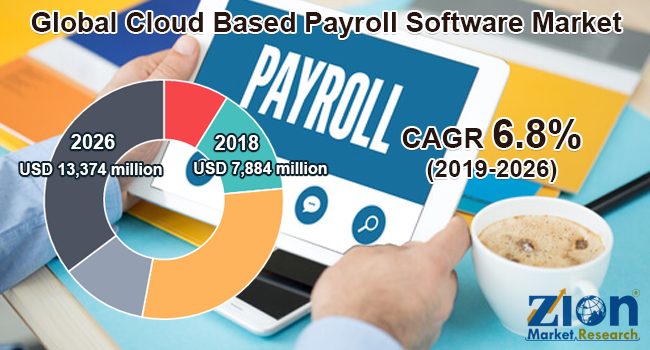 Some key players of the global cloud based payroll software market are Paycor, Inc., Paychex, Inc., Personnel Data Systems, Inc., Criterion, Inc., Sage Group, Lucerna, Accentra Technologies Limited, Workday, Inc., The Ultimate Software Group, Inc., Oracle Corporation, Zenefits Software, SAP Success Factors, Ascentis HR Software, FinancialForce Software, Kronos Software, IRIS Software Group, Ltd. and ADP.